Letter of reference for B.B. Frost & Co.
Letter to George Pullman requesting references for B. B. Frost & Co. and their financial standing with Pullman. Title Letter of reference for B.B. Frost & Co. 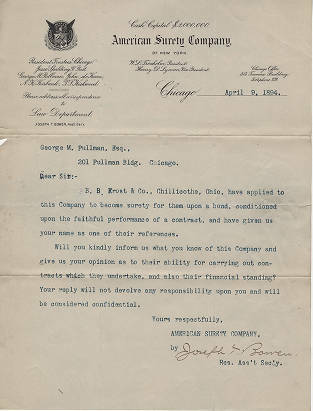 Description Letter to George Pullman requesting references for B. B. Frost & Co. and their financial standing with Pullman.